After we married, we moved to an amazing property just outside Chicago where we live with our horses. I was also pregnant during our move. 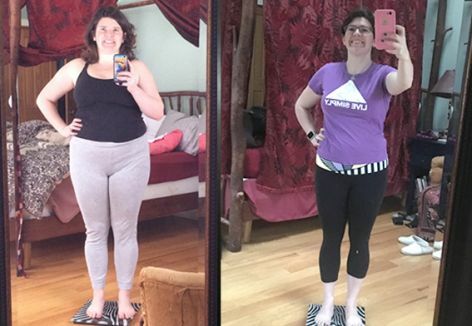 Between the move and the pregnancy, I put on over 60 pounds. I’d already been introduced to DietBet via Cassey Ho and Jillian Michaels (I was actually in a DietBet when I got pregnant – oh, the irony! ), and I was so grateful to know that it would be there on the other side to help me take the weight off! I love that DietBet not only holds me accountable for reaching certain milestones, but also provides a little “pep in my step” when it comes to weight loss – because it makes it a fun game, while demanding that you master certain skills and continue learning to play better, which keeps you coming back for more! I also really appreciate that your weight goal is based on a percentage, not a number of pounds, so it’s attainable regardless of your starting weight. There’s nothing left to chance in a game where you’re in control of the outcome. I love it! My first win was awesome. I lost my initial bets and felt frustrated by it…then I got honest about how I’d “cheated” or hadn’t made the changes that I know move the needle for me. Actually winning got me hooked on continuing to win and strategizing as I experimented with staggering bets to nudge me along in the right direction. Plus, the virtual community of likeminded players makes being in the activity feeds feel like coming home to a supportive weight loss family! We share ideas, struggles, and triumphs, so I never feel like I’m playing alone, and I can connect with players instantly if I need support. Today, I’ve lost almost 50 pounds and have experienced so many non-scale victories along the way: being able to ride my horses comfortably again, zipping up my favorite boots, doing a wall sit for 30 seconds without sliding down to the floor. When I started my DietBet journey, I felt sluggish, heavy, and like everything was hard to do. Now, I feel energized, light, and fit for my next challenge.